Now that it’s December, it’s time to start thinking about Hanukkah. I say this in a completely joking sort of way, because Hanukkah starts on December 8th this year and I’d be in big trouble if I just started thinking about it now! Actually, next year Hanukkah starts on Thanksgiving. Just saying. Before I go on, I’d just like to state my normal Hanukkah disclosure – I don’t love the commercialization of the holiday and while I think Hanukkah’s importance as a Jewish holiday has been exaggerated due to its proximity to Christmas, I still love getting things for my kids and enjoy finding good deals on gifts for them. As I see good deals and ideas, I snag them if they seem like things my kids would enjoy and I use Hanukkah as an excuse to give them gifts! So far I am ready for Hanukkah for Gabbie and Zachary, but not for Simon. He is only 2 and I honestly would not stress about getting him a gift every night, but I don’t think he’d be happy if the other kids get gifts and he doesn’t. We have too many toys and he probably wouldn’t appreciate decor for his room or the like! (Which by the way, is one of the gifts Gabbie is getting!) So if anyone has any ideas to fill in the gaps for him, please let me know! 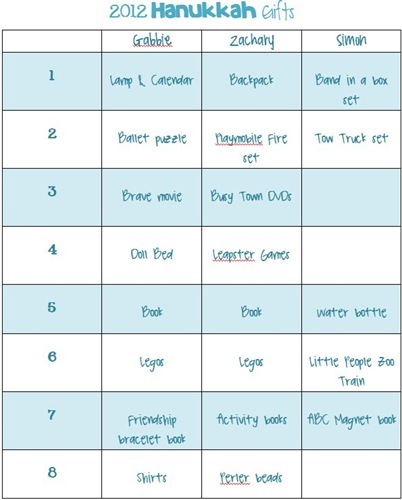 I will go more into detail about each gift the kids get during Hanukkah, but today I wanted to share a document I made in order to keep track of what gifts I’m giving each night. I’ve even made a blank copy of the document for anyone to use! Click here for a blank version of the document!